Ali thinks her life is finally moving forward. She has a cute boyfriend that lives with her, a job running the local flower shop and a hobby as a ceramicist. She also teaches at the community center in her spare time. Her latest endeavor is to raise money for a new community center and since her boyfriend, Teddy is the town jerk, I mean clerk who is supposed to meet her at the fundraising gala. Instead she hears him in his office with another woman and gets a text from him later telling her he has moved on and out. Not realizing that the lease is up on their rental, she wakes up to find her landlord in her kitchen. Luke has just had his own devastating ordeal when his job as a police detective goes horribly wrong. He heads back to the house that was left to him by his grandmother and rented out to - you guessed it -- Ali. Instead of peace and quiet, he finds he may have met the love of his life. Luke and Ali are both givers and it was such a pleasure to read about their instant chemistry, the humor that appears from the first page and just how happy these books make me. There is a bit of mystery in each of Shalvis' books and the one in this book about some missing money (that tied in nicely to an opening scene in the book) that only a good detective like Luke could unravel. Luke is one of those harden cop guys that have a nice soft center. The way he is described makes you melt. It just feel so right when everything in this story comes together. Oh! This is probably my favorite so far in the Lucky Harbor series. While this is part of the series, any of these books can stand alone. This giveaway is sponsored by Forever Romance and ONE copies will be available. Thank you for a great review, I can't wait to read it. I love this series and am super excited to read this next book! Jill's books never disappoint! I am a big fan of Jill's books! Thanks for the giveaway. Thanks for the giveaway. I'm really excited about this book. I seem to have fallen behind in the Lucky Harbor series, will have to catch up this summer! A return to Lucky Harbor. Always a good thing! Thanks! I love Jill Shalvis books! Thanks for the chance! I've never read any of her works, but this sure sounds like a must read. I love this series and can't wait to read this new release. Thanks for the giveaway. I love finding new books!! And this one sounds really GOOD! I'm really looking forward to reading this one!! Thank you so much for an awesome giveaway!! I am so excited to read It Had To Be You! 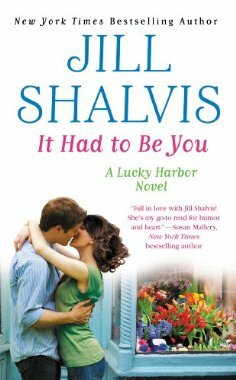 i am a huge fan of the Lucky Harbor series and more of Jill Shalvis' books! I did tweet this giveaway also.